1 Alternatively spelled as "Erevan", "Jerevan", or "Erivan". 2 Rank based on 2005 UN estimate of de facto population. 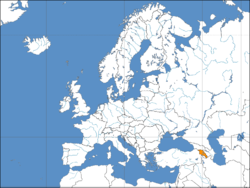 Armenia ( Armenian: Հայաստան Hayastan, Հայք Hayq), officially the Republic of Armenia, is a landlocked mountainous country in Eurasia between the Black Sea and the Caspian Sea, located in the Southern Caucasus. It shares borders with Turkey to the west, Georgia to the north, Azerbaijan to the east, and Iran and the Nakhichevan exclave of Azerbaijan to the south. A former republic of the Soviet Union, Armenia is a unitary, multiparty, democratic nation-state and one of the oldest and most historic civilizations in the world with a rich cultural heritage, as well as the first nation to adopt Christianity as its official religion. Although Armenia is constitutionally a secular state, the Christian faith plays a major role in both its history and the identification of the Armenian people. Culturally, historically, and politically, Armenia is considered to be part of Europe. However, its location in the southern Caucasus means that it can also be considered to be at the arbitrary border between Europe and Asia: in other words, a transcontinental nation. However, both these classifications are entirely arbitrary, as there is no easily definable geographic difference between Asia and Europe. Armenia is currently a member of more than 35 different international organizations including the United Nations, the Council of Europe, Asian Development Bank, the Commonwealth of Independent States, World Trade Organization and Organization of the Black Sea Economic Cooperation. It is a Partnership for Peace ( PfP) member of the North Atlantic Treaty Organisation and in a military alliance of CSTO. It is also an observer member of the Eurasian Economic Community, La Francophonie, and the Non-Aligned Movement. Armenian is also active in the international sports community with full membership in the Union of European Football Associations and International Ice Hockey Federation. The country is an emerging democracy and because of its strategic location, it lies among both the Russian and American spheres of influence. The modern Armenian name for the country was Hayq, later Hayastan. Hayasa, combined with the Persian suffix ' -stan' (land). Haik was one of the great Armenian leaders after whom the The Land of Haik was named. According to legend, Haik was a great-great-grandson of Noah (son of Togarmah, who was a son of Gomer, who was a son of Japheth, who was a son of Noah), and according to an ancient Armenian tradition, a forefather of all Armenians. He is said to have settled at the foot of Mount Ararat, travelled to assist in building the Tower of Babel, and, after his return, defeated the Babylonian king Bel (believed by some researchers to be Nimrod) in 2492 BC near the mountains of Lake Van, in the southwestern part of historic Armenia (present-day eastern Turkey). Hayq was given the name Armenia by the surrounding states, presumably as it was the name of the strongest tribe living in the historic Armenian lands, who called themselves Armens who were of Proto-Indo-European descent. It is traditionally derived from Armenak or Aram (the great-grandson of Haik's great-grandson, and another leader who is, according to Armenian tradition, the ancestor of all Armenians). Some Jewish and Christian scholars write that the name 'Armenia' was derived from Har-Minni, that is 'Mountains of Minni' (or Mannai). Pre-Christian accounts suggest that Nairi, meaning land of rivers, used to be an ancient name for the country's mountainous region, first used by Assyrians around 1200 BC; while the first recorded inscription bearing the name Armenia, namely the Behistun Inscription in Iran, dates from 521 BC. The Kingdom of Urartu during the time of Sarduris II in 743 BC. Armenia has been populated since prehistoric times, and has been proposed as the site of the Biblical Garden of Eden. Armenia lies in the highlands surrounding the Biblical mountains of Ararat, upon which, as tradition states, Noah's Ark came to rest after the flood. (Gen. 8:4). Archeologists continue to uncover evidence that the Armenia and Armenian Highlands were among the earliest sites of human civilization. From 4000 BC to 1000 BC, tools and trinkets of copper, bronze and iron were commonly produced in Armenia and traded in neighbouring lands where those metals were less abundant. During the ancient period of Armenia's history, several states flourished on its territory, including Aratta (3rd millennium BC), Mitanni and Hayasa-Azzi (15th - 12th cc BC), Nairi (12th - 9th cc BC), and the Kingdom of Urartu (9th - 6th cc BC), each participating in the ethnogenesis of the Armenian people. The Urartian language was closely related to the earlier Hurrian language of Syria and Anatolia, but it had no other certain relatives, and is not in the same language family as Armenian, which is in the Indo-European family. Yerevan, the modern capital of Armenia, was founded in 782 BC by the Urartian king Argishti I.
Kingdom of Armenia at its greatest extent under Tigranes the Great. Around 600 BC, the Kingdom of Armenia was established under the Orontid Dynasty, which existed under several local dynasties till AD 428. The kingdom reached its height between 95 - 66 BC under Tigranes the Great, becoming one of the most powerful kingdoms of its time. Throughout its history, the kingdom of Armenia enjoyed periods of independence intermitted with periods of autonomy subject to contemporary empires. Armenia's strategic location between two continents has subjected it to invasions by many peoples, including the Assyrians, Greeks, Romans, Byzantines, Arabs, Mongols, Persians, Ottoman Turks and Russians. In 301, Armenia became the first country in the world to adopt Christianity as its official state religion. There had been various pagan communities before Christianity, but they were converted by an influx of Christian missionaries. Tiridates III (AD 238-314) was the first ruler to officially Christianize his people, his conversion ten years before the Roman Empire granted Christianity official toleration under Galerius, and 36 years before Constantine was baptised. After the fall of the Armenian kingdom in 428, most of Armenia was incorporated as a marzpanate within the Sassanid Empire, ruled by a marzpan. Following an Armenian rebellion in 451, Christian Armenians maintained their religions freedom, while Armenia gained autonomy and the right to be ruled by an Armenian marzpan unlike other territories of the empire where the marzpan was a Persian. The Marzpanate of Armenia lasted till 630s, when Sassanid Persia was destroyed by Arab Caliphate. After the marzpanate period (428-636), Armenia emerged as an autonomous principality within the Arabic Empire, reuniting Armenian lands previously taken by the Byzantine Empire as well. 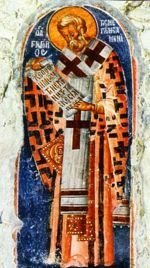 The principality was ruled by the Prince of Armenia, recognized by the Caliph and the Byzantine Emperor. It was part of the administrative division/emirate Arminiyya created by the Arabs, which also included parts of Georgia and Caucasian Albania, and had its centre in the Armenian city Dvin. The Principality of Armenia lasted till 884, when it regained its independence from the weakened Arabic Empire. The reemerged Armenian kingdom was ruled by the Bagratuni dynasty, and lasted till 1045. In time, several areas of the Bagratid Armenia separated as independent kingdoms and principalities such as the Kingdom of Vaspurakan ruled by the House of Artsruni, while still recognizing the supremacy of the Bagratid kings. In 1045, the Byzantine Empire conquered Bagratid Armenia. Soon, the other Armenian states fell under Byzantine control as well. The Byzantine rule was short lived, as in 1071 Seljuk Turks defeated the Byzantines and conquered Armenia at the Battle of Manzikert, establishing the Seljuk Empire. To escape death or servitude at the hands of those who had assassinated his relative, Gagik II, King of Ani, an Armenian named Roupen with some of his countrymen went into the gorges of the Taurus Mountains and then into Tarsus of Cilicia. Here the Byzantine governor of the place gave them shelter where the Armenian Kingdom of Cilicia was eventually established. The Seljuk Empire soon started to collapse. In the early 1100's, Armenian princes of the Zakarid noble family established a semi-independent Armenian principality in Northern and Eastern Armenia, known as Zakarid Armenia. The noble family of Orbelians shared control with the Zakarids in various parts of the country, especially in Vayots Dzor and Syunik. Southern parts of Armenia remained under control of Kurdish dynasties of Shaddadids and Ayyubids. The United States contributed a significant amount of aid to the Armenians during the Armenian Genocide. Shown here is a poster for the American Committee for Relief in the Near East vowing that they (the Armenians) "shall not perish." As the empire began to collapse, the Young Turks overthrew the government of Sultan Hamid. Armenians living in the empire hoped that the Young Turk revolution would change their second-class status. However, with onslaught of World War I and the Ottoman Empire's assault on the Russian Empire, the new government began to look on the Armenians with distrust and suspicion. This was due to the fact that the Russian army contained a contingent of Armenian troops. On April 24, 1915, Armenian intellectuals were arrested by Ottoman authorities and eventually a large proportion of Armenians living in Anatolia perished as a result of the Armenian Genocide. The events of 1915 to 1917 are regarded by Armenians and the vast majority of Western historians to have been state-sponsored mass killings, or genocide. Despite overwhelming evidence of genocidal intent, Turkish authorities maintain that the deaths were the result of a civil war coupled with disease and famine, with casualties incurred by both sides. Most estimates for the number of Armenians killed range from 650,000 to 1.5 million. Armenia and the Armenian diaspora have been campaigning for official recognition of the events as genocide for over 30 years. These events are traditionally commemorated yearly on April 24, the Armenian Christian Martyr Day, or the Day of the Armenian Genocide. Although the Russian army succeeded in gaining most of Ottoman Armenia during World War I, their gains were lost with the Russian Revolution of 1917. At this time, Russian-controlled Eastern Armenia, Georgia, and Azerbaijan attempted to bound together in the Transcaucasian Democratic Federative Republic. 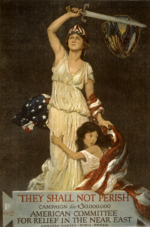 This federation, however, only lasted from February to May 1918, when all three parties decided to dissolve it. As a result, Eastern Armenia became independent as the Democratic Republic of Armenia (DRA) on May 28. Unfortunately, the DRA's short-lived independence was fraught with war, territorial disputes, a mass influx of refugees from Ottoman Armenia, spreading disease, and starvation. Still, the Entente Powers, appalled by the actions of the Ottoman government, sought to help the newly-found Armenian state through relief funds and other forms of support. At the end of the war, it was decided to divide up the Ottoman Empire. Signed between the Allied and Associated Powers and Ottoman Empire at Sèvres on August 10, 1920, the Treaty of Sèvres promised to maintain the existence of the DRA and to attach the former territories of Ottoman Armenia to it. Because the new borders of Armenia were to be drawn by United States President Woodrow Wilson, Ottoman Armenia is also "referred to as "Wilsonian Armenia." There was even consideration of possibly making Armenia a mandate under the protection of the United States. The treaty, however, was rejected by the Turkish National Movement, and never came into effect. The movement, under Mustafa Kemal Atatürk, used the treaty as the occasion to declare itself the rightful government of Turkey, replacing the monarchy based in Istanbul with a republic based in Ankara. The Coat of Arms of Soviet Armenia. In 1920, Armenia and Turkey engaged in the Turkish-Armenian War, a violent conflict that ended with the Treaty of Alexandropol in which the Armenians surrendered the bulk of their weapons and land to the Turks. Simultaneously, Armenia was invaded by the Red Army, which led to establishment of Soviet rule in Armenia in December of 1920. The treaty of Alexandropol, signed by deposed former Armenian officials after the establishment of Soviet rule, was never ratified by the new Communist government. In 1922, the country was incorporated into the Soviet Union as part of the short-lived Transcaucasian SFSR along with Georgia and Azerbaijan. The Treaty of Alexandropol was then superseded by the Treaty of Kars, between Turkey and the Soviet Union. In it, Turkey ceded the province of Ajara to the Soviet Union in return for sovereignty over the territories of Kars, Ardahan, and Iğdır. Because the Armenians did not have a say in the treaty, Armenia, to this day, does not recognize the treaty as legitimate and still holds claims to those provinces. 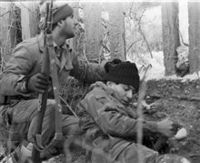 Armenian soldiers firing against Azerbaijani forces from trenches in Nagorno-Karabakh. The TSFR existed from 1922 to 1936, when it was divided up into three separate entities ( Armenian SSR, Azerbaijan SSR, and Georgian SSR). Armenians enjoyed a period of relative stability under Soviet rule. They received medicine, food, and other provisions from Moscow, and communist rule proved to be a soothing balm in contrast to the turbulent final years of the Ottoman Empire. The situation was difficult for the church, which struggled under Soviet rule. After the death of Vladimir Lenin, Joseph Stalin took the reins of power and began an era of renewed fear and terror for Armenians. As with various other ethnic minorities who lived in the Soviet Union during Stalin's Great Purge, tens of thousands of innocent Armenians were either executed or deported. Fears decreased when Stalin died in 1953 and Nikita Khruschev emerged as the country's new leader. The façade of the National Assembly of Armenia in downtown Yerevan. Politics of Armenia takes place in a framework of a presidential representative democratic republic, whereby the President is the head of government, and of a pluriform multi-party system. Executive power is exercised by the government. Legislative power is vested in both the government and parliament. The unicameral parliament (also called the National Assembly) is controlled by a coalition of three political parties: the conservative Republican party, the Armenian Revolutionary Federation, and the Country of Law party. The main opposition is composed of several smaller parties joined in the Justice Bloc. Robert Kocharian is the republic's current president. The Armenian government's stated aim is to build a Western-style parliamentary democracy as the basis of its form of government. However, international observers have questioned the fairness of Armenia's parliamentary and presidential elections and constitutional referenda since 1995, citing polling deficiencies, lack of cooperation by the Electoral Commission, and poor maintenance of electoral lists and polling places. For the most part however, Armenia is considered one of the more pro-democratic nations in the Commonwealth of Independent States. It has universal suffrage above the age of eighteen. Map of the administrative divisions of Armenia. 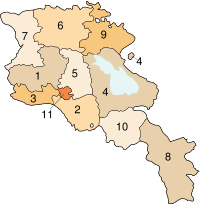 Armenia is divided into 10 marzes ( regions, sing. 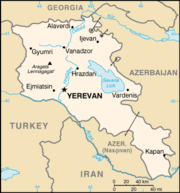 - marz) with the city of Yerevan (Երևան) having special administrative status as the country's capital. The chief executive in each of 10 marzes is the marzpet (marz governor), appointed by the government of Armenia. In Yerevan, the chief executive is the mayor, appointed by the president. Armenia is a landlocked country in the southern Caucasus. Located between the Black and Caspian Seas, the country is bordered on the north and east by Georgia and Azerbaijan, and on the south and west by Iran and Turkey. The Republic of Armenia, covering an area of 30 000 square kilometres (11,600 sq. mi), is located in the north-east of the Armenian Highland (covering 400 000 km² or 154,000 sq. mi), otherwise known as historic Armenia and considered as the original homeland of Armenians. The terrain is mostly mountainous, with fast flowing rivers and few forests. The climate is highland continental: hot summers and cold winters. The land rises to 4095 metres (13,435 ft) above sea-level at Mount Aragats, and no point is below 400 metres (1,312 ft) above sea level. Mount Ararat, regarded by the Armenians as a symbol of their land, is the highest mountain in the region and used to be part of Armenia until around 1915, when it was given to Turkey under the Treaty of Kars. Armenia is trying to address its environmental problems. It has established a Ministry of Nature Protection and introduced taxes for air and water pollution and solid waste disposal, whose revenues are used for environmental protection activities. Armenia is interested in cooperating with other members of the Commonwealth of Independent States (CIS, a group of 11 former Soviet republics) and with members of the international community on environmental issues. The Armenian Government is working toward closing its Nuclear Power Plant at Medzamor near Yerevan as soon as alternative energy sources are identified. The climate in Armenia is markedly continental. Summers are dry and sunny, lasting from June to mid-September. The temperature fluctuates between 22° and 36°C. However, the low humidity level mitigates the effect of high temperatures. Evening breezes blowing down the mountains provide a welcome refreshing and cooling effect. Springs are short, while falls are long. Autumns are known for their vibrant and colorful foliage. Winters are quite cold with plenty of snow, with temperatures ranging between -5° and -10°C. Winter sports enthusiasts enjoy skiing down the hills of Tsakhkadzor, located 30 minutes outside of Yerevan. 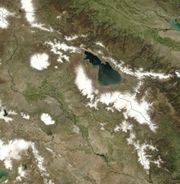 Lake Sevan nestled up in the Armenian highlands, is the second largest lake in the world relative to its altitude, 1,900 meters above sea level. Until independence, Armenia's economy was largely industry-based – chemicals, electronics, machinery, processed food, synthetic rubber, and textile – and highly dependent on outside resources. Agriculture contributed only 20% of net material product and 10% of employment before the breakup of the Soviet Union in 1991. The republic had developed a modern industrial sector, supplying machine tools, textiles, and other manufactured goods to sister republics in exchange for raw materials and energy. Downtown Yerevan in 2005. 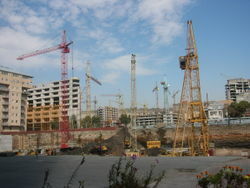 An ongoing construction boom has kept Armenia’s economic growth in double digits. Like other newly independent states of the former Soviet Union, Armenia's economy suffers from the legacy of a centrally planned economy and the breakdown of former Soviet trading patterns. Soviet investment in and support of Armenian industry has virtually disappeared, so that few major enterprises are still able to function. In addition, the effects of the 1988 Spitak Earthquake, which killed more than 25,000 people and made 500,000 homeless, are still being felt. The conflict with Azerbaijan over Nagorno-Karabakh has not been resolved. The closure of Azerbaijani and Turkish borders has devastated the economy, because Armenia depends on outside supplies of energy and most raw materials. Land routes through Georgia and Iran are inadequate or unreliable. GDP fell nearly 60% from 1989 until 1992– 1993. The national currency, the dram, suffered hyperinflation for the first years after its introduction in 1993. Nevertheless, the government was able to make wide-ranging economic reforms that paid off in dramatically lower inflation and steady growth. The 1994 cease-fire in the Nagorno-Karabakh conflict has also helped the economy. Armenia has had strong economic growth since 1995, building on the turnaround that began the previous year, and inflation has been negligible for the past several years. New sectors, such as precious stone processing and jewelry making, information and communication technology, and even tourism are beginning to supplement more traditional sectors in the economy, such as agriculture. This steady economic progress has earned Armenia increasing support from international institutions. The International Monetary Fund (IMF), World Bank, European Bank for Reconstruction and Development (EBRD), and other international financial institutions (IFIs) and foreign countries are extending considerable grants and loans. Loans to Armenia since 1993 exceed $1.1 billion. These loans are targeted at reducing the budget deficit, stabilizing the currency; developing private businesses; energy; the agriculture, food processing, transportation, and health and education sectors; and ongoing rehabilitation in the earthquake zone. The government joined the World Trade Organization on February 5, 2003. But one of the main sources of foreign direct investments remains the Armenian diaspora, which finances major parts of the reconstruction of infrastructure and other public projects. Being a growing democratic state, Armenia also hopes to get more financial aid from the Western World. A liberal foreign investment law was approved in June 1994, and a Law on Privatization was adopted in 1997, as well as a program on state property privatization. Continued progress will depend on the ability of the government to strengthen its macroeconomic management, including increasing revenue collection, improving the investment climate, and making strides against corruption. In the 2005 Transparency International CPI ( Corruption Perception Index) chart, Armenia ranked 88 (in a range of 1 through 158), continuing to remain as one of the least corrupt states among former Soviet Republics. According to the 2005 UN Human Development Report, Armenia has a Human Development Index ( HDI) of 83 (from a range of 1 through 177), the highest among the Transcaucasian republics. In the 2006 Index of Economic Freedom, Armenia ranked 27th best, tied with Japan and ahead of countries like Norway, Spain, Portugal and Italy. The rank puts Armenia in the category of "Mostly Free" countries, making it the most economically free state in the Commonwealth of Independent States. 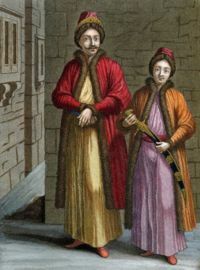 Engraving of an Armenian couple. Ethnic Armenians make up 97.9% of the population. Yazidi Kurds make up 1.3%, and Russians 0.5%. There are smaller communities of Assyrians, Georgians, Greeks and Ukrainians. Most Azerbaijanis, once a sizable population, have left their homes since Armenia's independence. Armenia has a very large diaspora (8 million by some estimates, greatly exceeding the 3 million population of Armenia itself), with communities existing across the globe, including France, Russia, Iran, Lebanon, and America. Approximately 120,000 Armenians now live in the disputed Nagorno-Karabakh region. The predominant religion in Armenia is Christianity. The roots of the Armenian Church go back to the 1st century. According to tradition, the Armenian Church was founded by two of Jesus' twelve apostles -- Thaddaeus and Bartholomew -- who preached Christianity in Armenia between 40-60 AD. Because of these two founding apostles, the official name of the Armenian Church is Armenian Apostolic Church. 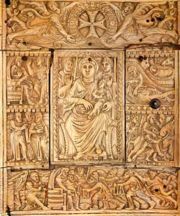 Armenia was the first nation to adopt Christianity as a state religion, in 301. Over 93% of Armenian Christians belong to the Armenian Apostolic Church, a form of Oriental (Non- Chalcedonian) Orthodoxy, which is a very ritualistic, conservative church, roughly comparable to the Coptic and Syriac churches. Armenia also has a population of Catholics (both Roman and Mekhitarist - Armenian Uniate (180,000)), evangelical Protestants and followers of the Armenian traditional religion. The Yazidi Kurds, who live in the western part of the country, practise Yazidism. The Armenian Catholic Church is headquartered in Bzoummar, Lebanon. 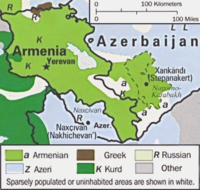 Ethnic Azeris and Kurds who lived in the country before the Karabakh conflict practised Islam, but most Azeris fled out of Armenia into Azerbaijan between 1988 and 1991 at the beginning of the conflict. During the same period, a large number of Armenians fled from Azerbaijan to Armenia. Mother Armenia (Mayr Hayastan) statue, located near Victory Park, in Yerevan. Armenians have their own highly distinctive alphabet and language. The letters were invented by Mesrop Mashtots and consists of 36 letters. 96% of the people in the country speak Armenian, while 75.8% of the population additionally speaks Russian as a result of the Soviet language policy. The adult literacy rate in Armenia is 99%. Most adults in Yerevan can communicate in Russian, while English is increasing in popularity. Armenian hospitality is legendary and stems from ancient tradition. Social gatherings focused around sumptuous presentations of course after course of elaborately prepared, well-seasoned (but not spicy-hot) food. The hosts will often put morsels on a guest's plate whenever it is empty or fill his or her glass when it gets low. After a helping or two it is acceptable to refuse politely or, more simply, just leave a little uneaten food. Alcohol such as cognac, vodka, and red wine are usually served during meals and gatherings. It is considered rare and unusual for one to go inside an Armenian household and not be offered coffee, pastry, food, or even water. Although located in Turkey, Mount Ararat, here seen from Yerevan, is the national symbol of Armenia. The weddings are usually quite elaborate and regal. The process begins by the man and woman becoming "promised". The man's immediate family (Parents, Grandparents, and often the Uncles and Aunts) go over to the woman's house to ask for permission from the woman's father for the relationship to continue and hopefully prosper. Once permission is granted by the father, the man gives the woman a "promise ring" to make it official. To celebrate the mutual family agreement, the woman's family opens a bottle of Armenian cognac. After being promised, most families elect to have a semi-large engagement party as well. The girl's family is the one who plans, organizes and pays for the party. There is very little involvement by the man's family. At the party, a priest is summoned to pray for the soon husband and wife to be and give his blessings. Once the words of prayer have concluded, the couple slide wedding bands on each other's right hands (the ring is moved to the left hand once a formal marriage ceremony is conducted by the Armenian church). The customary time to wait for the marriage is about one year. Unlike other cultures, the man and his family pay for the wedding. The planning and organization process is usually done by the bride and groom to be. The National Art Gallery in Yerevan has more than 16,000 works that date back to the Middle Ages. It houses paintings by many European masters. The Modern Art Museum, the Children’s Picture Gallery, and the Martiros Saryan Museum are only a few of the other noteworthy collections of fine art on display in Yerevan. Moreover, many private galleries are in operation, with many more opening each year. They feature rotating exhibitions and sales. The world-class Armenian Philharmonic Orchestra performs at the beautifully refurbished city Opera House, where you can also attend a full season of opera. In addition, several chamber ensembles are highly regarded for their musicianship, including the National Chamber Orchestra of Armenia and the Serenade Orchestra. Classical music can also be heard at one of several smaller venues, including the State Music Conservatory and the Chamber Orchestra Hall. Jazz is popular, especially in the summer when live performances are a regular occurrence at one of the city’s many outdoor cafés. Yerevan’s Vernisage (arts and crafts market), close to Republic Square, bustles with hundreds of vendors selling a variety of crafts, many of superb workmanship, on weekends and Wednesdays (though the selection is much reduced mid-week). The market offers woodcarving, antiques, fine lace, and the hand-knotted wool carpets and kilims that are a Caucasus specialty. Obsidian, which is found locally, is crafted into an amazing assortment of jewelry and ornamental objects. Armenian gold smithery enjoys a long and distinguished tradition, populating one corner of the market with a selection of gold items. Soviet relics and souvenirs of recent Russian manufacture—nesting dolls, watches, enamel boxes and so on, are also available at the Vernisage. The American University of Armenia has graduate programs in Business and Law, among others. The institution owes its existence to the combined efforts of the Government of Armenia, the Armenian General Benevolent Union, USAID, and the Boalt Hall School of Law at the University of California, Berkeley. The extension programs and the library at AUA form a new focal point for English-language intellectual life in the city. Many of the country’s most successful young entrepreneurs are graduates of this institution. Gyumri, Shirak is the second largest city in Armenia. St. Gregory the Illuminator Cathedral in Yerevan. The Cathedral was completed in September 2001 in time for the celebration of the 1700th anniversary of Christianity in Armenia.